If you are a qualified solicitor looking for a new role or partnership in a practice or your first role as a Solicitor after qualifying then you will need to be able to show that you have completed a Law Degree followed by any further training and practical work experience in your chosen area. Solicitors represent their clients in all manner of areas from housing purchases to divorces, family law, legal disputes, business and personal and you may specialise at some point in one particular area depending on your specialism’s. You will need to be a confident individual as you will be holding meetings with clients, representing them so your communication skills will need to clear and concise at all times. You will also need to be able to hold confidential information at all times. I am a methodical and very driven person who enjoys being involved in Law and the legal aspects of how things work. I enjoy researching and learning new laws and skills and keeping up to date on government changes affecting the legal side. I am a confident communicator with an excellent manner where I can explain details to my clients in a way in which they understand. I work well on my own initiative and at times this is the best way to concentrate fully on a case but I also work well with my research and preparation team finding out more information as necessary. I have not specialized within law yet but I am not closed to do this down the line, I am currently interested in finding out as much as I can about Law before doing this. Date to Date or To Date – Solicitor – Where? Dictating letters and notes relevant to my clients and cases. Ensure you list all your Legal qualifications and any specialized training courses that you have done. 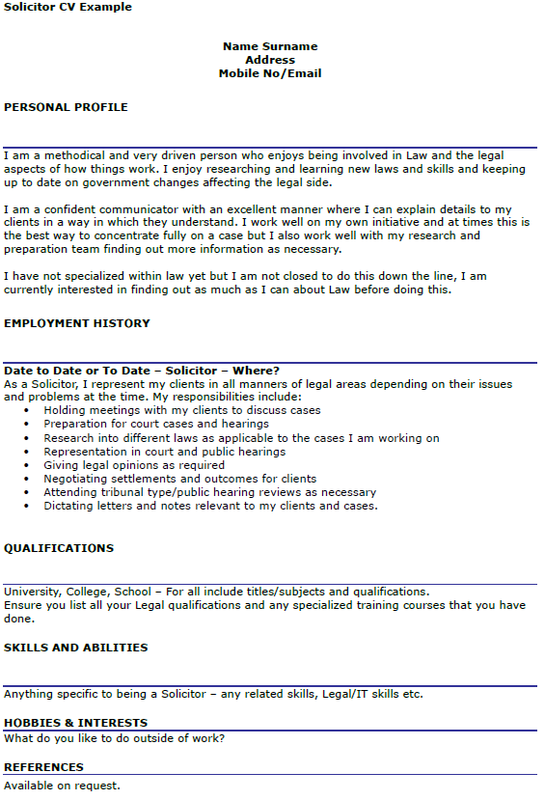 Anything specific to being a Solicitor – any related skills, Legal/IT skills etc.